I'm pretty sure I've featured Nabla on my blog before, when I showed you guys swatches of the Dreamy eyeshadow palette which you can read about here, so when I saw they were releasing a concealer which looked to be giving the Tarte Shape Tape a run for its money, along with a loose setting powder I just knew I had to try them out. The shade range is pretty limited for the concealer, with only 9 colours available which is definitely not a great start, but yet it's still better than a lot of brands on the high street. 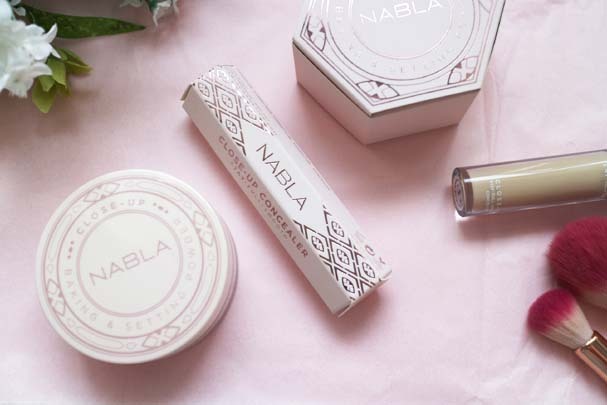 It's also worth noting for those who have never heard of the brand Nabla, they are cruelty-free & vegan! I was so impatience, I couldn't wait for Beauty Bay to launch them on its website, so I ordered directly from Nabla. 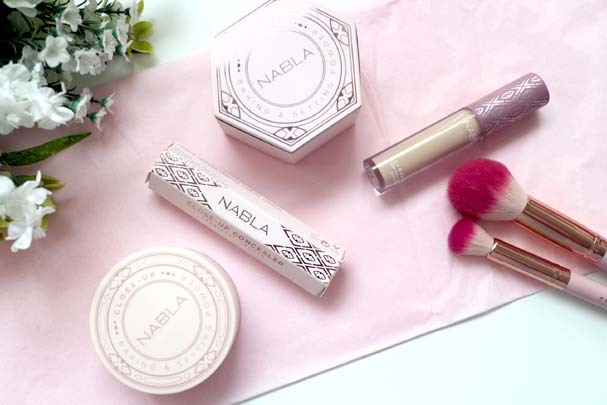 It was a tiny bit of a pain to check out but we got there eventually, and I walked away with Nabla Close Up Concealer in Ivory (£15/ € 15,90) and the Nabla Close Up Baking & Setting Powder in Translucent (£16/€ 18), along with a liquid lipstick which I may feature in a future post once I get round to trying it out. They arrived pretty fast, I ordered it on Friday night and by Monday afternoon my parcel had been delivered! I've been playing around with the products since then, trying a whole mix match of foundations and powders to see how it wears. If you guys are like me packaging is always a biggie. I'm a sucker for anything that comes nice presented, and this did not disappoint. Even the inside of the parcel had a super cute floral print alongside the Nabla branding. 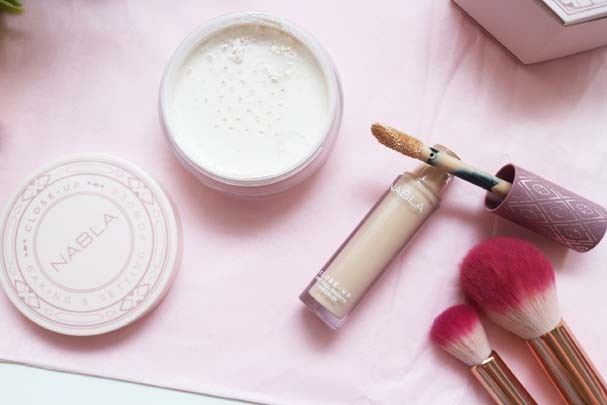 The products came in two cute pale pink cardboard packaging, the powder comes in a light pink shifter packaging, and the concealer has a very similar packaging to the Tarte Shape Tape concealer bottle apart from an Aztec pattern on the lid. The packaging is super sleek and definitely vanity worthy. Firstly, it's worth noting that the concealer smells exactly like the Physician's Formula Butter Bronzer and if that isn't a huge selling point then what is! Secondly, this finely milled setting and baking powder, DOES NOT have flashback or leave a white cast which is a biggie, meaning it is perfect for flash photography or a night on the town. The 'ivory' shade of concealer is yellow based, which I found perfect for brightening underneath the eye - but it's definitely not the type of product you'd go to for spot concealing. It also has a very similar doe foot applicator to the Tarte Shape Tape, with quite a big wand and I find it really easy for flawless application. I didn't find the concealer to crease much, although the lines under my eyes definitely looked better between using the Nabla Close Up powder compared to my RCMA No Colour powder. The powder didn't cling to dry patches around the eyes or make the concealer look super matte or dry. The concealer seems to last a really long time, although the dark circles under my eyes did start to show through around the 9-hour mark, pretty much meaning you can get a full working day wear out of the concealer. A little bit of the concealer seems to go a long way but you do only get 4ml which isn't a great deal. I did find the concealer pretty easy to blend out and the formula didn't seem to lift my foundation as I was blending it out. Will you be picking this up any time soon? What's your ride or die concealer? Yeah the Nabla swatches are always to die for! I've ran out of my Conceal and Define and haven't managed to get round to picking another one up yet, but it's definitely on my list of makeup to replace!